An international group of scientists has described an animal that provides nutrition for its young by letting them peel off and eat its skin. The worm-like amphibian develops a nutritious outer layer of skin, and looks "relaxed" while its young rips it off with their teeth. The researchers say this kind of parenting has never been seen before in land-living animals. The discovery is reported in a paper in the journal Nature. The Boulengerula taitanus is found in the Taita Hills of south-eastern Kenya. It lives underground and can grow up to 30cm (12in) in length. Adults have two rows of pointed teeth and feed on termites and insects. The species was first identified in 1935, but its remarkable parenting methods have up until now remained undescribed. An international scientific team carried out an expedition to Kenya to study the creature. The group collected some of the amphibians and set up videos to record their behaviour. "The young are hatching out of eggs but they are not very well developed," explained Dr Alexander Kupfer, an author on the paper and a zoologist from the Natural History Museum, UK. "They have very milky teeth and with these they rip off the mother's skin; but the mother seems very relaxed - not moving at all." 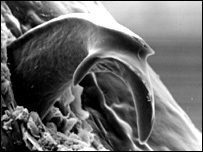 The skin of female B. taitanus becomes thicker and more nutrient-rich when she bears offspring and the young have specialised teeth for tearing and removing it. 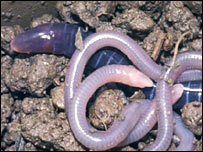 The B. taitanus belongs to the group of amphibians called caecilians. While the B. taitanus young hatch out of eggs, a high percentage of species give birth to live young. In live-bearing caecilians, the foetuses feed on the womb-like oviduct of their mothers. Because they do this using similarly shaped teeth to the B. taitanus, the scientists believe that B. taitanus may be an evolutionary precursor to live-bearing caecilians. Dr Mark Wilkinson, who participated in the research and is also a scientist at the Natural History Museum, commented that B. taitanus might shed light on other feeding relationships between mother and child. "You can draw parallels between skin feeding in these creatures and lactation in mammals, so studying how this form of parenting evolved might shed light on how parenting developed in mammals."